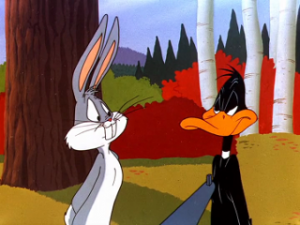 In light of Cartoon Network this weekend offering a Looney Tunes marathon, I thought I’d make this week’s entry “Misce-Looney-Ous,” a blog about the various media depictions of the Looney Tunes characters. Besides covering the usual cartoons, the blog also covers all manner of other appearances of the characters—cameos in “Tiny Toon Adventures,” the comics (from off-model looking old Dell stories to the modern DC Comics Looney Tunes series), public service announcements, and all manner of merchandise. Of particular interest is some of the old TV commercials they’ve dug up (thanks to YouTube) featuring Bugs and the gang. Besides a lot of McDonald’s ads from the 90s (“Space Jam”, etc. ), there’s also a ton of ads featuring the Road Runner, as the blog points out. (I’m sure they’ll be interested in the GEICO ad featuring the Road Runner and Coyote.) We also get to see promos from international versions of Cartoon Network, such as a Latin American one where the Flash races the Road Runner and Speedy Gonzales. As noted before, there’s also commentary on some of the Looney Tunes’ shorts themselves, including some of the more obscure ones, such as the punning-but-dubiously named final classic-era Looney Tunes short produced, the 1969 Cool Cat cartoon “Injun Trouble.” Due to Native American stereotypes (as well as an innuendo), this one never appears on American television, though apparently does sometimes show up in overseas syndication packages. Misce-Looney-Ous’ creators also have recently started a companion blog, dedicated to the Looney Tunes characters’ comics appearances.